Call us at 802-362-3750 for information on upcoming classes and seminars this season. 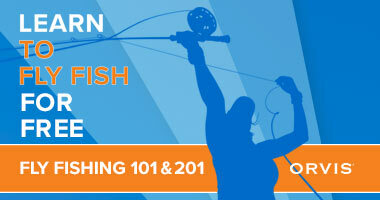 If you’ve already completed Fly Fishing 101, you’re ready for the next step. Join us for a short outing on local water and a chance to catch your first fish! A nominal fee for the outing may apply. Take the Fly Fishing 101/201 experience to the next level. Orvis Fly Fishing School instructors will be leading morning and afternoon sessions on local trout streams. These guided trips will focus on techniques and strategies used to catch the beautiful wild trout of the Green Mountains region. This time of year can offer some fantastic dry-fly fishing on little feeder streams for our native brookies. Our on-the-water instruction and practice on actual fish can't be duplicated on a city lawn or parking lot. Participants must have a VT fishing license and their own gear. Orvis will provide flies. Space is extremely limited, so call or stop by the Flagship Store to reserve your spot. Cost: $100 per angler, two anglers per instructor. Whether you're completely new to fly fishing or just want to perfect your existing skills, our Fly-Fishing School in Vermont is guaranteed to be fun and interesting. You will learn the art of casting with a patient instructor who will take you from the basic steps to the point where you can cast a tight loop farther than you ever imagined. Call our Manchester store or click here for more information. The Orvis Wingshooting School in Manchester is just minutes away from our Flagship Store. The is a world-class course staffed with professional shotguns shooting instructors ready to help turn novices into skilled shooters and skilled shooters into experts. Call our Manchester store or click here for more information. Fishing Manager: Josh Robinson Born in Annapolis, MD, Josh grew up fishing for many different species from the Chesapeake Bay to western Maryland. He studied Sustainable Agriculture and Food Production at Green Mountain college in Vermont, where he fell in love with the area and in fall of 2013 joined the Manchester Flagship store team. In his spare time Josh can be found hiking and fishing in the Green Mountains, gardening and volunteering for stream side restoration projects.